Chances are I made a fool of myself when trying to solve an intriguing math/physics puzzle described in this post. I wanted to create a German version but found it needs a revision. I will just give you my stream of consciousness as I cannot make it worse anyway. Consider three lines in a flat plane, not parallel to each other and not intersecting in a single point. Their mutual intersection points are the corners of a triangle. Assuming that the probability to find an arbitrary point on either side of each line is 50% – what is the probability to find a point within the triangle? The three lines divide the full area into 7 parts – the triangle in the center and 6 sections adjacent to the triangle: Each of these parts is located either ‘to the left’ or ‘to the right’ of each line, called the ‘+’ and ‘-’ parts. There are 8 possible combinations of + and – signs, but note that the inverse of the symbols assigned to the triangle is missing: (-+-) Digression: It would be there if we painted these lines on a ball instead of a flat plane – then each line would close on itself in a circle and there would be 8 equivalent triangles. The combination missing here would correspond to the triangle opposite to the distinguished and singular triangle in our flat plane. I had assumed that the 7 areas are equivalent based on ‘symmetry’ – each area being positioned on either side of one of three planes – and assuming that the condition given (50%) is not physical anyway. A physical probability would vary with distance from the line – imagine something like a Gaussian symmetrical distribution function centered around each line. Than the triangle would approximately correspond to the area of highest probability (where the peaks of the three Gaussians overlap most). Do you spot the flaw? The lower half contains 4 different parts (1x triangle, 2x open trapezoid, 1x open wedge), and the lower half contains two open wedges and one open trapezoid. Probabilities should add up to 50% in each half though. 2) the sum of probabilities of all pieces on either side of a line should add up to 0,5! This was the assumption after all. Probabilities don’t add up correctly if I assign the same probability to each of the 7 pieces – it is 4/7 for the lower half and 3/7 for the upper half. So I need to amend my theory and rethink the probability assigned to different kinds of areas (I guess mathematicians have a better term for ‘kinds of areas’ – more like ‘topologically equivalent’ or something.). A triangle formed by the three lines. Three ‘open wedges’ formed by two lines – e.g. part (- – -) in the lower half. 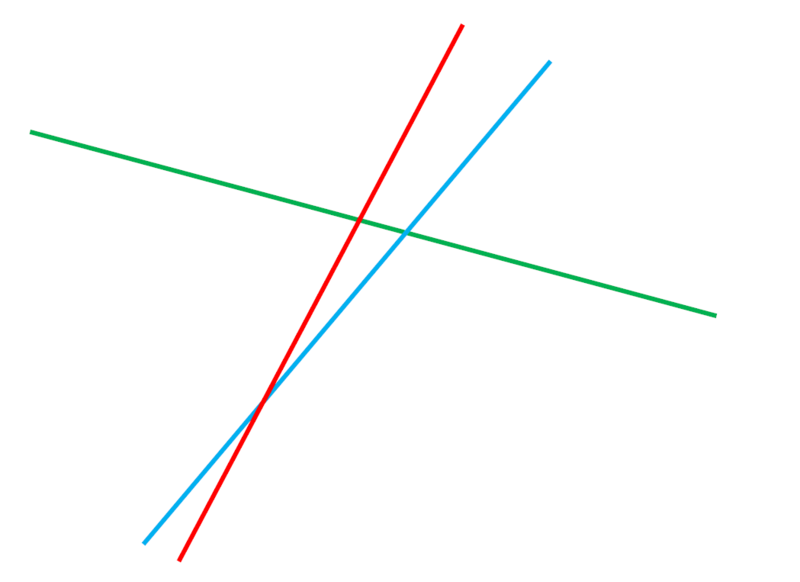 Three ‘open trapezoids’ formed by three lines, e.g. part (+++) in the upper half. 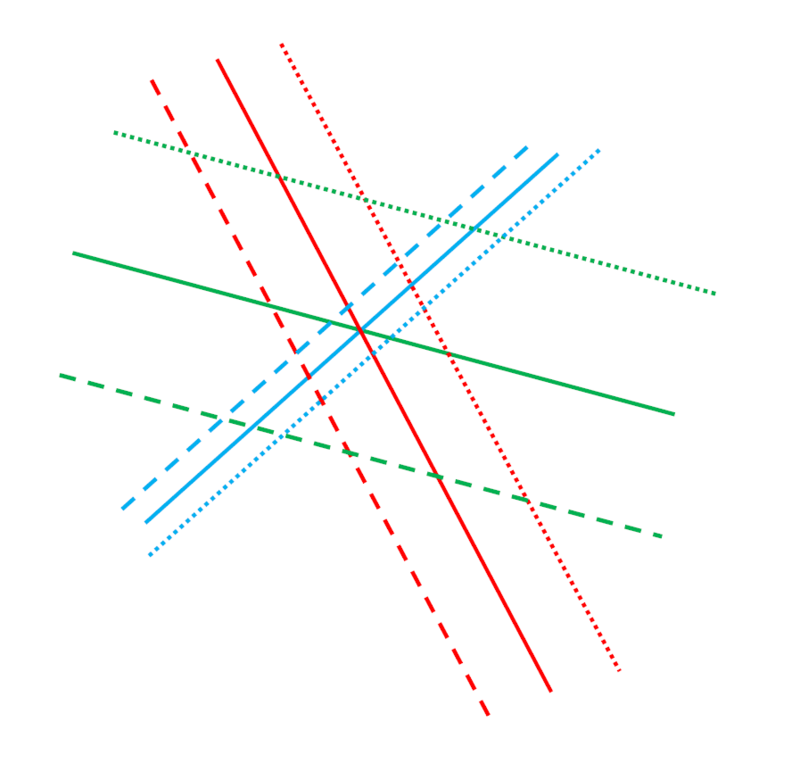 In the limiting case of the blue and red lines coalescing we would end up with four quarters, and you would find an arbitrary point with a probability of 25% in either quarter. In the video Quantum Boffin has asked for the probability of the triangle – which can be any triangle, of any arbitrary shape and size, and he states that there is a definitive answer. Therefore I think also the details of size and shape of the other areas do not matter, and the 50% assumption is somewhat unphysical. As there are three distinct types of shapes – I need three equations to calculate them all. Notation in the following: p… probability. T…triangle, W…wedge, Z…trapezoid. p(T) denotes the probability to find a point in the triangle. We need 50% on either side of a line. Now the sum ii) and iii) is just i) that these equations are not independent. We need one more information to solve for p(T), p(W), and p(Z)! And here is my great educated guess: You have to make another assumption and this has to be based on a limiting case. How else could we make an assumption for an arbitrary shape? I played with different ones, such as letting iv) p(W) = 0,25 motivated by the limiting case of a nearly right angle. Interestingly, you obtain a self-consistent solution. Just plugging in and solving you get: p(T)=0,25 and p(Z)=0. Cross-checking you see immediately that this is consistent with the assumptions – probabilities sum of to 50%: You either have two Ws or one W and the T in one half of the plane. Assigning 0 to the trapezoid does not seem physical though. We can do better. So what about assigning equal probabilities to Z and W? iv) p(Z) = p(W)? I don’t need to do the algebra to see that p(T) has to be zero as you would have 3 equivalent pieces on each side, but the triangle can only be located one one side. This assumption is in line with the limiting case of a really infinite plane. The triangle has finite size compared to 6 other infinite areas. I change my proposal to: The probability to find an arbitrary point in the triangle is zero – given the probability to find it on either side of each line is 50% and given that the area is infinite. Again I’d like to stress that I consider this a math puzzle as the 50% assumption does not make sense without considering a spatial variation of probability (probability density, actually). Based on the ingenious proposal by Jacques Pienaar in the comments, I am adding a sketch highlighting his idea. Theoretically, the center of mass would correspond to the intersection of the 3 “perfect” solid lines. Now allow for some “measurement error” and add an additional line denoting the deviations. I depicted the “left” and “right” lines as dashed and dotted, respectively. Since we have 3 colors and either a dashed or a dotted lines, there are 8 distinct triangles. I tried to make the angles and distances as random as possible, so I think Jacques’ proof does not depend on the details of the configuration or the probability distribution function (yet beware the limiting cases such as parallel lines). The intersection of the solid lines is within 2 of 8 triangles – hence a probability of 2/8 = 1/4. I was intrigued by an odd coincidence as I had played with 0,25, too (see above), but based on the assumption that of a probability of 0,25 for the wedges/corners – which by cranking the algebra or just cross-checking the 50% criterion results in p(Triangle)=0,25, too, and in p(Trapezoid)=0. But it is difficult to make a statement on the corners or wedges as any intersecting two lines cut the plane in 4 parts and any point is found in one of them. I was tempted to pick p(W) = 0 though, but this would result in p(Triangle)= -0,25. So this was probably not the last update or the last post related to the enigma of the intersecting lines. This entry was posted in Physics, punktwissen, Science and Technology and tagged Geek, Geek Collection, Geometry, Mathematics, Probability, Puzzle by elkement. Bookmark the permalink. That’s very interesting – I hope you will blog about your learning endeavors! I have come across so many great online resources for people self-studying physics – probably I should make an attempt to write more consistent summaries. Great find! I really enjoyed trying to figure this one out. I think the answer is actually 1/4. If you consider each line independently, the assumption that the centre-of-mass is equally likely to be on one side as on the other side is perfectly physical: it just means that the probability distribution is symmetric about the mean, and this is true for Gaussians as well as many other possible distributions. So I am fine with that assumption. At first, like you, I thought that the answer had to depend on the shape of the probability distribution around the mean. But I’ve since changed my mind about that too. Here’s how I arrived at my answer. Suppose that your experiment actually is perfectly accurate and you already know where the centre-of-mass is, and have marked it with a black spot. Now suppose that you would like to simulate errors by “pretending” to get the wrong result. So, when you perform the experiment, instead of drawing the vertical line through the object where you are supposed to, you instead decide to draw a parallel vertical line, shifted horizontally by some fixed distance either to the left or to the right of where it should be. You repeat this for the other two lines, deciding on whether to make the error on the left or the right at each step. At the end of the experiment, your incorrect lines have made a triangle. Now here’s the cool part: the resulting triangle will either contain the centre-of-mass point inside it, or it won’t. You can go through each of the eight possible combinations of choices (LLL,LLR,LRL,RLL,LRR,RLR,RRL,RRR) until you have drawn eight triangles on the object, in relation to the actual centre-of-mass point. Since the probability of choosing left or right is equal for each line, the probability for obtaining each of these combinations is 1/8. Now you can simply count how many of the resulting triangles contain the centre-of-mass point, and divide by eight. It turns out that only two of the triangles contain the centre-of-mass: LRL and RLR. Hence the probability is equal to 1/4. Thanks for your detailed comment, Jacques! I don’t object to 1/4 at all as I had considered it myself, but for different reasons: Assuming p(Wedges)=0,25 and p(Trapezoids)=0, hence p(Triangle)=0. But I guess this is just a coincidence! 2) Assume wedges and trapezoids are equal in probability, my final proposal – results in 0 for the triangle, as pointed out by a user commenting on my old post today (and who missed one equation, too). 3) Some specific distribution – such as yours. I admit this seems to be the most physical assumption, and most in line with the spirit of the puzzle 😀 – that had been presented as a physics rather than a math puzzle. Thanks again for taking the time to solve it! Thanks, again – yes, you are right! With a proof for any distribution it would be sorted out. I was thinking about starting with a delta-function-shaped distribution and then extend to any function (in the spirit of Greens functions, sort of). But the proof has to be simple as freshman students should need to be able to solve it. I guess it is sufficient to start with your “arbitrary black dot” and make sure that the geometrical proof (…counting areas…) does not depend on the specific position of this dot. Jacques, how about a uniform distribution? I.e. imagine a simple computer simulation that picks a random number uniformly distributed over the entire float range (of course you can’t really have a uniform distribution on the real numbers). This will nevertheless do nicely to approximate a triangle in an infinite plane. Of course with this kind of probability distribution chances to get a point inside the triangle are astronomically small. But of course this is an entire unphysical assumption. In reality you are quite right that you should have something like a normal distribution (not exactly though, due to the boundary condition where the probability must be zero). Nevertheless if we again assume a huge plane a normal distribution will do nicely, and repeated experiments would give you a good estimate for your standard error. At this point it just becomes a matter of multiplying your normal distributions and normalizing the resulting distribution function. IMHO, contrary to the contention in the video, the question is meaningless without assuming a probability distribution. Thanks, Henning! It seems things are always getting messy if you consider some limiting case… as two of three lines coalescing into one or that uniform distribution (which would support the p(Triangle)=0 hypothesis). The creator of the video mentioned he stumbled on the puzzle while contemplating a math problem. Therefore I had also considered it unphysical. I am still hoping for a mathematician recognizing the puzzle and commenting here. Hi again, Jacques – I have now made an update including a sketch of your proposal. I played a bit with drawing the lines as random as possible, and yes it feels as if the “2 out of 8 triangles” rule hold for any angles between the lines and for any distance of the “erroneous” lines from the perfect ones. I have then tried to reconcile this with my earlier approach and thinking about wedges and trapezoids as there seems to be some relation as the true center of mass seems to be in 2 of 8 “trapezoids”. But alas, the probability for the corners seems to be problematic. I like your diagram! I was drawing similar things on my blackboard at work. I’m not sure how to extend the idea to answer your question about the trapezoids, but one of my physics friends went a bit crazy on this and he claims to have extended the result to the intersection of d+1 hyperplanes of a d-dimensional solid. He says the hyperplanes intersect at a simplex (higher dimensional tetrahedron) and the probability of the centre of mass being inside the simplex is 2^(-d). I have no idea if he’s right … but there you go. Thanks, Jacques! Let me know when your friend publishes a paper on those hyper-dimensional objects so I can reference it properly here! Hi there Elke assuming that the plane is infinite then the area of the triangle is vanishingly small compared to the ares of the (infinite) plane 🙂 p(inside) is therefore practically zero. I am with you.